How Will Thailand’s Bonds Be Affected If The Central Bank Decides On Rate Cuts? Mexico has been an anomaly in Latin America when it comes to monetary policy this year. All its major peers – Brazil, Peru, Chile, and Colombia – have slashed their key rates in YTD 2017. On the other hand, Banco de Mexico has been hiking its Official Overnight Rate as shown by the graph below. At 7%, the rate is at its highest since early 2009. The central bank had to continue increasing the overnight rate in order to combat inflation which has itself reached a level not seen since the end of 2008. The Mexican peso was one of the factors putting pressure on inflation. As shown in the graph above, the currency has had quite an eventful one year. Its weakness against the dollar post the US Presidential election in November last year, which bottomed out on the eve of the inauguration of President Trump, put considerable pressure on consumer prices in Mexico. The peso, which had declined nearly 6% against the greenback by January 19, later reversed course and rose 15.7% by mid-July, thus taking some pressure off inflation. 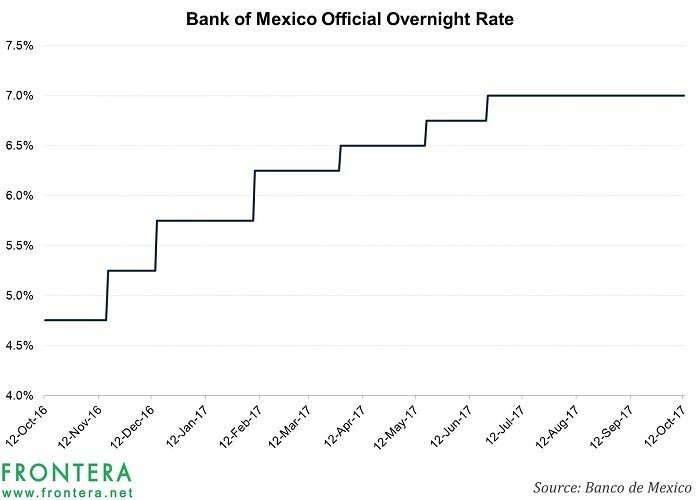 The Banco de Mexico last raised its overnight rate in June 2017 and had indicated the action may mark the last step in the rate hiking cycle. Its hawkish stance on inflation may be paying off with consumer prices declining for September as shown by the graph below. But even after the small dip, inflation remains much higher than the central bank’s target range of 3%, plus or minus one percentage point. However, there are other concerns. Negotiations over North American Free Trade Agreement (NAFTA) have been a big hurdle in the path of a rate cut. 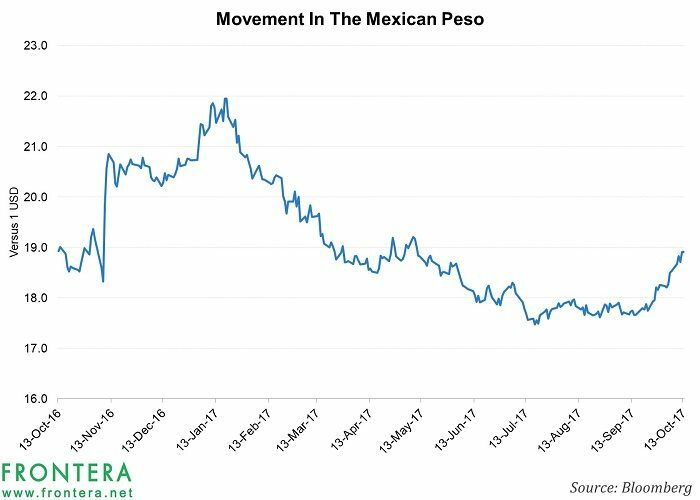 Recent developments have hurt Mexican financial assets across the board including its currency and bonds, as shown in the graph below. The hawkish stance of the US Federal Reserve is another problem. In the past, Banco de Mexico has raised rates in sync with the US central bank in order keep local currency-denominated bonds attractive. Given that its rate tightening cycle may be at an end, further rate hikes by the US could reduce the appeal of Mexican bonds. 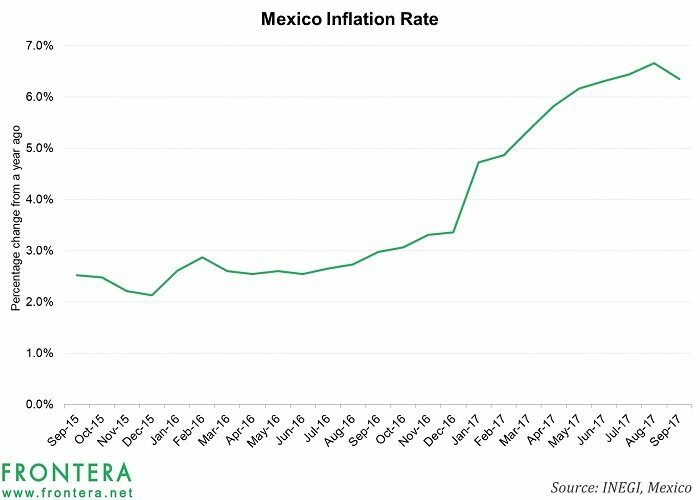 Had it not been for these issues Mexico’s central bank would have been in a position to effect a rate cut, given their confidence that inflation would continue to fall closer to their target in 2018. If outgoing governor Agustín Carstens deems fit, he can push for a rate cut before his tenure at the helm of the central bank finishes in November. At this juncture, odds seem to favor a status quo on policy rates. However, if a rate cut is effected, though it will dent bond yields in Mexico, it will help to anchor inflation expectations and can provide a leg up to the economy. 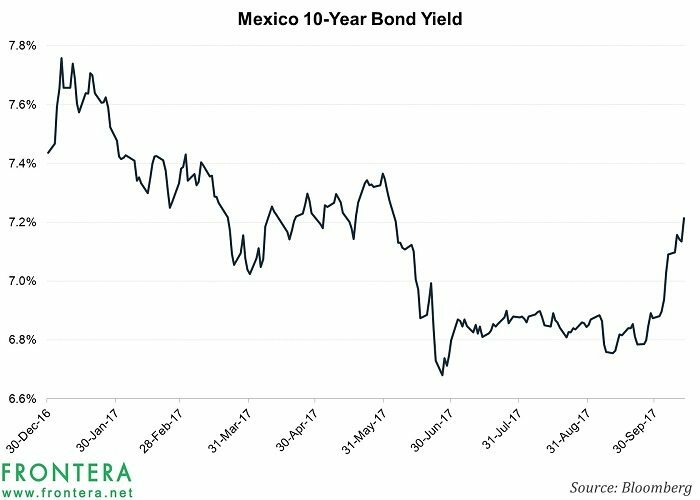 Renewed confidence in the economy can keep Mexican bonds in play for some time before an easing cycle is firmly in place. Previous articleHow Will Thailand’s Bonds Be Affected If The Central Bank Decides On Rate Cuts?